«Grably» restaurant is a nominee of the world competition for the best design of restaurants in 2016. 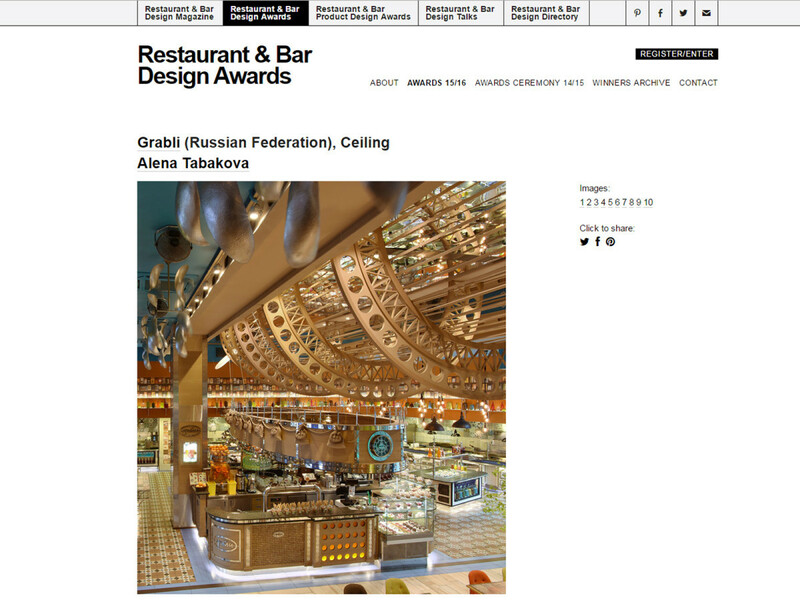 «Grably» restaurant in CCS on Lubyanka is a participant in global contest «Restaurant & Bar Design Awards» for the best design of restaurants. This is one of a kind contest that involves only public catering establishments – restaurants, cafes and bars. The jury consists of famous personalities: designers and professionals of the hospitality industry, journalists from leading publications devoted to architecture and design. Suffice it to mention such names as Karim Rashid, Sarah Miller – the publisher of Condé Nast Traveller, Ian Callum – Design Director of Jaguar Cars. The contest is organized by the British company, but projects from anywhere in the world may participate in it. There are over a dozen of nominations in Restaurant & Bar Design Awards: the best standalone restaurant, the best multiple restaurant, the best cafe or fast food restaurant, the best hotel restaurant, the best beer pub and the others. Throughout the history such restaurants were among the winners: «Galvin La Chapelle» (London), «theCUT» (Newcastle), «Elliot’s» (Edinburgh), «Sound» (Thailand), and «Pio Pio» (New York). «Grably» restaurant in CCS claims victory in two categories: «Best European restaurant» and «Best ceiling.» This year it is the only Russian restaurant in the segment of fast casual restaurants, participating in this contest. Creation of a dynamic interior where art objects are in motion, and computer animation is a part of interior solution, is an undoubted achievement of a renowned architect Alyona Tabakova. In the heart of Moscow there was created the space where visitors find themselves in a magic world full of unique objects, transforming dinner into the show. A two-level space was created with the ceilings that are used to the full to accommodate unusual art objects and structures.